Starting in the late 1960s, the microwave began to become popular with American consumers and have remained that way ever since. In August of 1967, Amana Refrigeration, an acquisition of Raytheon, developed its first microwave that was sold for under $500 and operated at 115 volts. These microwaves were well received by the public and the microwave industry was never the same. However, before the microwave could reach its full potential, manufacturers had to solve the problem of perception – a majority of the public was concerned about the potentially harmful effects of radiation. In 1970, the federal government set radiation standards for microwave ovens, which would help to dissipate the public’s concerns about radiation. 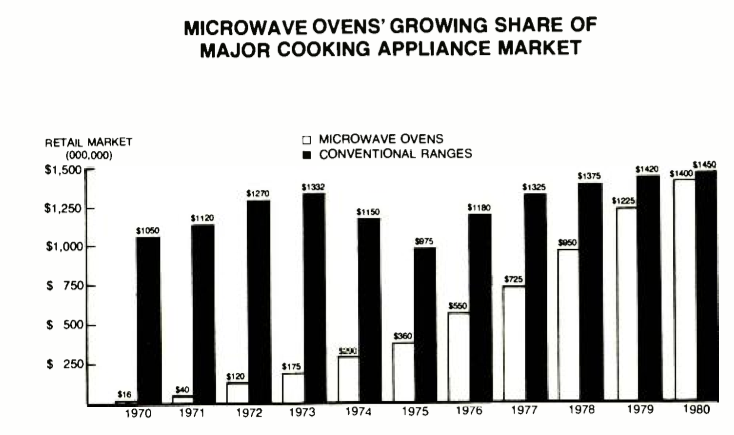 By 1970, approximately 10% of American households contained a microwave and they were still widely used in restaurants, and trends continued to show that the microwave oven’s popularity was only going to continue to grow. Throughout the early 1970s, various cookware companies were being to produce lines of dishes that were designed specifically for microwave use. 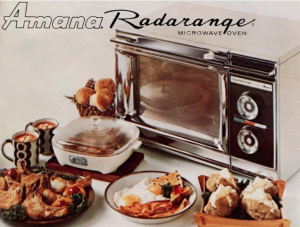 In just five years “microwave ovens were selling at over 1 million units annually, outselling gas ranges.”  One of the first popular microwaves was the Amana Radarange, which was a small size and easily fit into the “modern” kitchen. [Fig. 2 – Ralph E. Grabowski, “How the Microwave Oven Became a Super Success,” Ralph E. Grabowski – Steering the Enterprise to Success, last modified 2016, accessed March 20, 2017www.marketingvp.com/guests/globe/oven. One of the most important reasons behind the microwave oven’s popularity was the convenience factor that it bought to kitchens. 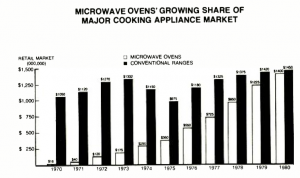 Microwaves were beneficial for cooks of any type – from experienced cooks to those who were culinary challenged. For the experienced cooks, microwaves allowed for free time. Before the microwave oven, preheating food was not something that commonly done. This was because there was no good way to reheat the food. If one did decide to reheat food, then it came out the cost of having to wash a multitude of dishes. There were the dishes the cooled food was stored in, then the separate skillet or pan needed to reheat the food, and finally the dishes the food was served in. This meant that lots of time was needed to prepare and clean up after a meal. This meant that practically every night, the cook would have to prepare a new meal every evening. However, when the microwave oven was introduced, leftovers provided for easy meals. Suddenly, microwave ovens allowed for leftovers, meaning that someone didn’t have to cook everyday. Now, meals could stay in the refrigerators remain for a few days, and be easily heated up. This meant that everyday, people had access to good, quality, home cooked meals everyday that did not require lots of preparation and cleaning. And if one was not a food home cook, then microwave oven still allowed for the opportunity to have good meals. Microwave ovens allowed for frozen meals to be thawed and ready to be eaten in a matter of minutes. Before the microwave there were frozen meals, however, since they were required to be heated in the oven, they did not save much time. But now, the quality of the foods not only increased, but was now was able to be eaten much quicker. Andrew F. Smith, Eating History – 30 Points in the Making of American Cuisine (New York: Columbia Press, 2009): 207. Eva, Bill. “Microwave Ovens for the Home – How They Work and What to Look for in Selecting One.” Popular Electronics, July 1976, 39 – 42. Lisa Salita, interviewed by Helen Salita, March 18, 2017, transcript Helen Salita, Richmond, Virginia. Copyright © 2019 The Microwave. All rights reserved.